Located in the panhandle of Florida, Carrabelle is laid-back and quiet . . . rural Florida . . . a small fishing village with friendly people and that Old Florida charm. Situated in Franklin County with Apalachicola as it’s county seat, Franklin County offers something for everyone with thousands of acres of state and federal forests, over 200 miles of deserted beaches, numerous rivers and the pristine waters of Apalachee Bay and the Gulf of Mexico offering some of Florida’s finest fishing! It’s always a great time to visit Carrabelle and Sandy Beach Properties offers over 30 vacation rentals with something for everyone . . . whether visiting for a weekend, a week or a month . 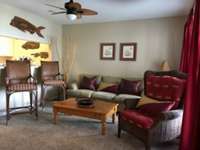 . . we have vacation rentals ranging from one bedroom luxury dockside cottages in a unique riverfront community at Pirates’ Landing on Timber Island to affordable three bedroom townhomes at the Sands of Carrabelle located just a few blocks from the Carrabelle River. We also manage waterfront condos and single family homes and cottages on the bay and on pristine, deserted beaches. You’ll find detailed information on vacation and long term rentals here but we would love to talk to you too! Our office hours are Monday – Friday, 9am to 5pm. Ask for Nan or Patty Lee – we will be happy to answer your questions and book your reservation, or make appointments to show long term rentals. Feel free to leave a voice mail or send an email after hours and she will get back with you the next morning. Please give us a call at 850-697-5300 and we’ll work hard to help you find your perfect piece of paradise. Many of our properties offer a mid-week special available Monday – Wednesday. Book Monday and Tuesday and get Wednesday free! Ask for details!